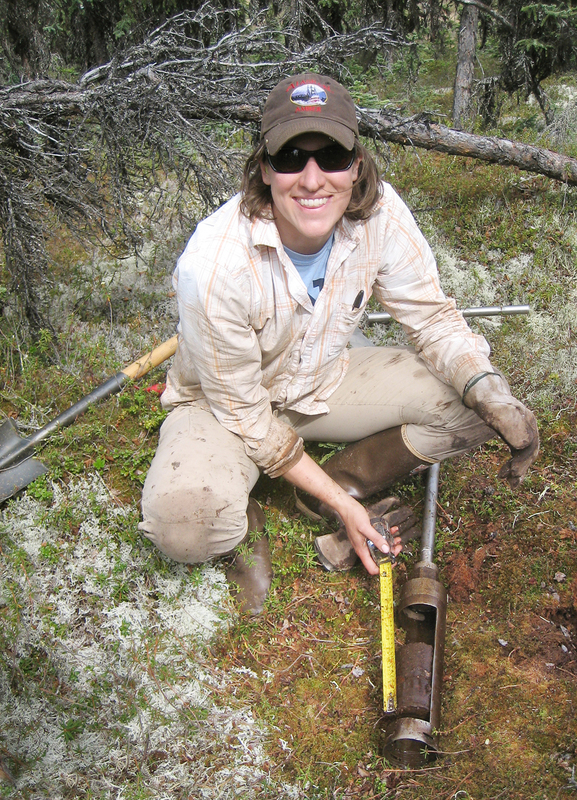 CLAIRE TREAT funded the bulk of her Ph.D. work by winning a graduate fellowship from the Department of Energy Office of Science for her proposal titled "Future of soil carbon in permafrost regions: The great northern carbon bomb?" To conduct this bomb detection, Treat gathered a variety of soil samples from sites in Alaska, incubated them, and mimicked various environmental conditions in a lab back at UNH where she finally measured the subsequent amount of carbon. 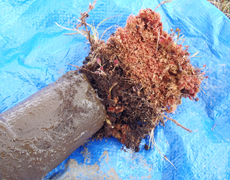 The gist of the research is that the amount of carbon released by the soil, and whether it occurs as carbon dioxide or as methane, will determine how much warming these northern soils will contribute to climate change. Photo by Carmel Johnston, Montana State University. Four years later, doctorate in hand and now a postdoc with the University of Alaska and the U.S. Geological Survey in Menlo Park, California, Treat says her dissertation work essentially found that not all permafrost is created equal and that the potential bomb appears to have a long fuse. "That had been one of the assumptions going into the work—that all permafrost was this super labile soil/organic matter that within several decades of thawing would decompose and all this carbon would be released to the atmosphere and enhance climate change," Treat says. "But I found that's not necessarily the case." To make the needed permafrost comparisons, Treat gathered some 200 samples from several different sites, including two boreal forests—one in Fairbanks and one within the Innoko National Wildlife Refuge 300 miles west of Fairbanks at the tip of Seward Peninsula—and two tundra sites around the University of Alaska Fairbanks Toolik Field Station on the North Slope above the Arctic Circle. At UNH, for two years one would see Treat traversing between Morse Hall and other campus labs cradling armloads of plastic tubs filled with soil samples. Her basic methodology was to let the jars of soil samples sit for a month while incubating at a constant temperature before drawing out gas with a syringe to measure how much carbon dioxide and methane had been produced. Her sample analysis found there were very different carbon losses between the soils collected in the boreal and tundra areas. 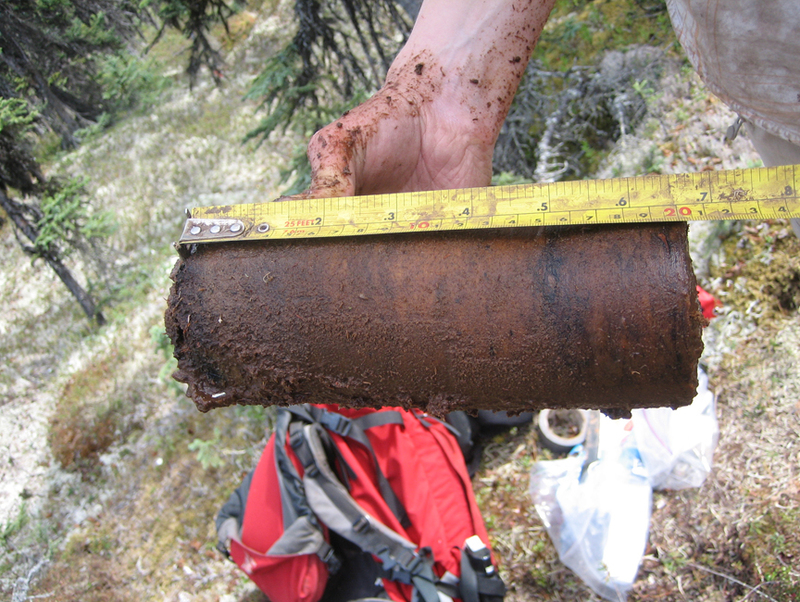 In the boreal peats, the active layer (the seasonally thawed surface soil layer), when heated up to an ideal incubation temperature released a lot of carbon while the permafrost didn’t. She thinks it’s because the permafrost formation histories are different. That is, in the Arctic, because it’s so much colder, the permafrost forms in the soil before it gets a chance to decompose, whereas in the more southern, boreal sites, even small climate variations can cause permafrost degradation and decomposition. permafrost in the Innoko NWR. 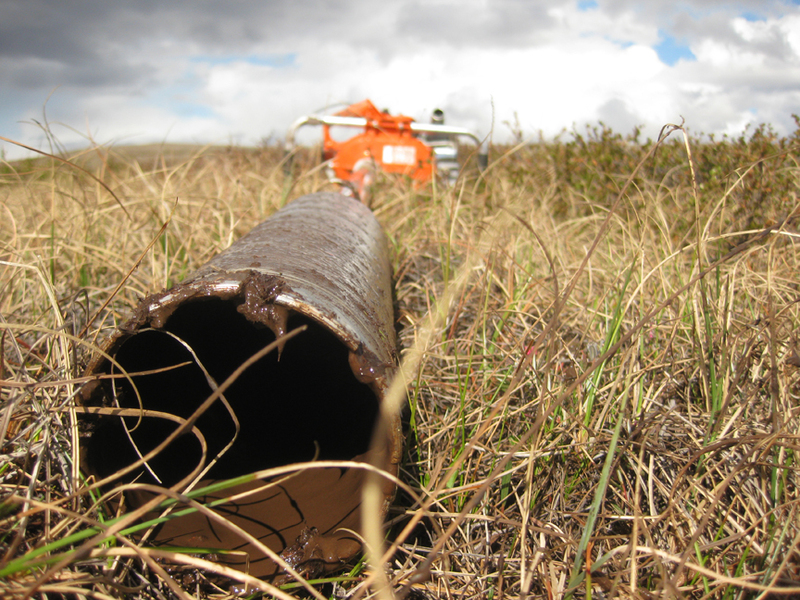 "So the soils in the permafrost in the more southern, boreal sites are really old and highly decomposed, as opposed to really old and not decomposed, which was the thinking going into the research,” Treat says. This matters because it means carbon losses from some northern soils will contribute more than others. The old freezer-turned incubator also came in handy for another part of Treat’s dissertation work with Wil Wollheim, co-director of the Water Systems Analysis Group within the Earth Systems Research Center (ESRC). Wollheim was working in the Alaskan tundra to determine whether climate change, through longer thawed seasons and shorter winters, was affecting nutrient cycling in streams. Treat and Wollheim, along with postdoc, Kyle Whittinghill, did field work at Toolik to ultimately measure nutrient concentrations in streams during the fall for the first time. Click here to view a short video of Treat and her Ph.D. advisor Wil Wollheim drilling core samples in Alaska. Photo by Adam Wlostowski, Penn State University. Another aspect of Treat’s Ph.D. work, which was supplemented for a year by a UNH Graduate School Fellowship, was doing a comprehensive synthesis of previous studies similar to her incubation experiments. “I conducted an anaerobic incubation synthesis where I and several colleagues compiled data from previous studies and looked for large-scale trends,” says Treat. For a while during the process of synthesizing twenty years worth of publications on the subject methane anaerobic incubation, Treat wondered whether or not she was pushing the science forward or simply pushing paper. “But then a funny thing happened as I was writing the conclusion section of my dissertation. I considered what my work actually meant in a broader context and then realized that the science hasn’t been synthesized and that I was able to bring many pieces from different fields together, as well as add some important new understanding. For example, the incubation work at UNH revealed that carbon losses from the permafrost in particular are dependent on the substrate, specifically, how decomposed it is and its condition—warm, cold, aerobic or anaerobic—and on the inherent microbial communities. 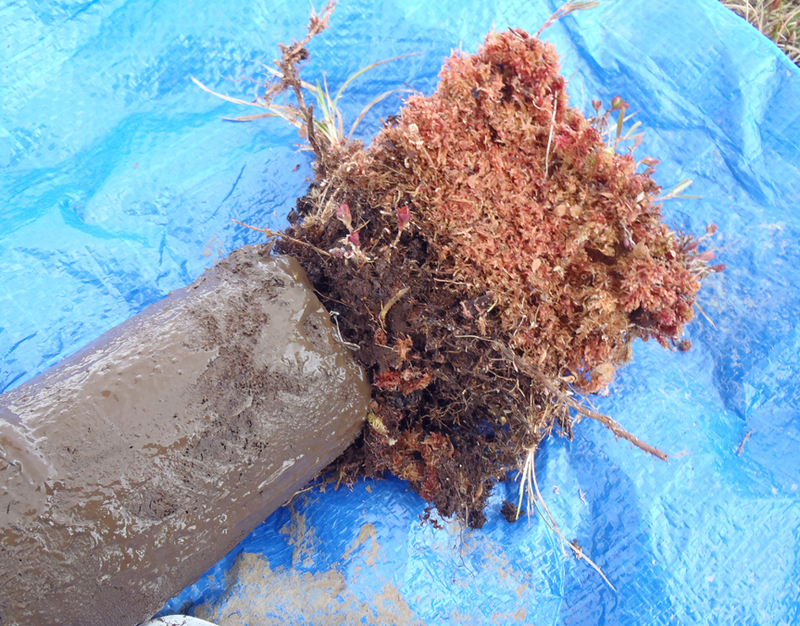 A soil core showing surface peat, which has lots of sphagnum moss bits, and permafrost peat. 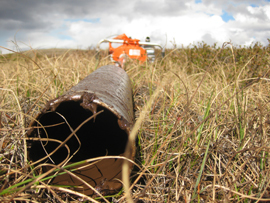 This core is from the Toolik Field Station on the North Slope above the Arctic Circle. Photo by Claire Treat, UNH-EOS. The results from the synthesis project revealed a lag period between the beginning of incubation and maximum methane flux, which is a totally different pattern than carbon dioxide production. Although further investigation into this will not be part of her postdoc work, Treat believes it is an important scientific area to investigate. As part of her postdoc work, Treat will be working with ESRC’s Steve Frolking (a member of her Ph.D. committee), current supervisor Miriam Jones of the USGS, and Katie Walter Anthony of the University of Alaska Fairbanks compiling fossilized wetland vegetation datasets to look at species composition and peatland extent in the panarctic. Methane clathrate, also known as methane ice, is a compound in which a large amount of methane is trapped within a crystal structure of water forming a solid similar to ice.